Want to find something relaxing and fun to do after work or when you can finally escape the kids for a few hours? 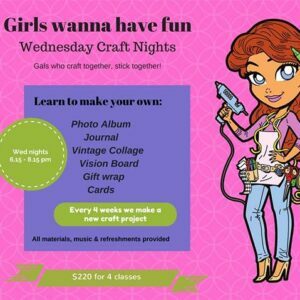 Then come join our all girl craft class and absorb yourself in the fun of making a new project every 4 weeks. We will put on the tunes, have some refreshments and basically have a good old crafty time with other like-minded gals!